Artist Dan Durda's concept for a U.S. postage stamp honoring the New Horizons mission to Pluto. The grassroots mission to land a Pluto-bound planetary probe on a postage stamp has caught the attention of postal authorities, the team that organized the campaign announced on Monday (Feb. 25). "Recently, we were issued a letter from the [United States Postal Service] USPS informing us that the New Horizons mission stamp proposal will be submitted for review and consideration before their Advisory Committee!" wrote Con Tsang, a research scientist at the Southwest Research Institute in Colorado, in an e-mail addressed to supporters and posted on the NASA mission's Facebook page. "We have cleared the first hurdle!" Last February, Tsang began a petition on the Change.org website urging the USPS and its Citizens' Stamp Advisory Committee to honor the first mission to Pluto with its own postage stamp. Backed by the New Horizon's flight team, including the mission's principal investigator Alan Stern, the petition collected more than 12,000 signatures by the time the effort ended on March 13, 2012. The campaign's conclusion was timed to coincide with the anniversary of the announcement of Pluto's discovery by American astronomer Clyde Tombaugh in 1930. NASA's New Horizons spacecraft was launched on Jan. 19, 2006 on a mission to flyby Pluto and its moons in July 2015. Seven years into the journey, the probe is now more than halfway between the orbits of Uranus and Neptune. "This entire process can take up to 3 years," Tsang wrote about the stamp selection timeline. "So we will most likely not know if a stamp is approved until around the time when New Horizons reaches Pluto in 2015." The Citizen's Stamp Advisory Committee has overseen the choice of themes for U.S. postage stamps since 1967. The three year process is designed to give enough time for the committee to consider the proposal, as well as the design and production of the stamp should the subject be selected. Over the past four decades, the committee has chosen to recognize the nation's space program on more than three dozen stamps. One of those stamps, issued in 1991, had a depiction of Pluto with the words "Not Yet Explored." 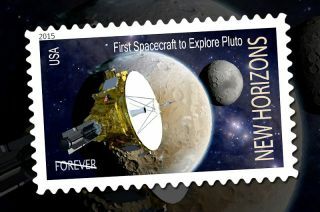 An example of that stamp is flying aboard New Horizons. Most recently, the USPS honored NASA's MESSENGER mission to the planet Mercury as part of a pair of stamps that also recognized the first American astronaut to fly in space, Alan Shepard. The New Horizons' petition asked the advisory committee to consider a stamp for the mission not just to honor the first Pluto flyby, but also the first exploration of the Kuiper Belt, the first exploration of an ice dwarf planet, and the farthest object ever explored in space.